Beautifully crafted with an attractive vintage feel, this delicately shaped band in sleek 9ct white gold is set with sparkling diamonds for an indulgent feel she'll fall in love with. 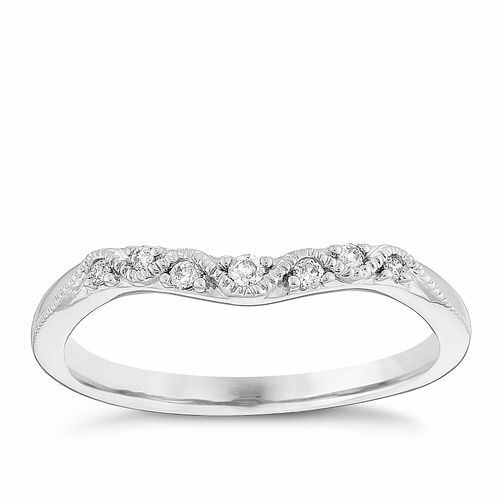 9ct White Gold Diamond Set Vintage Style Shaped Band is rated 4.8 out of 5 by 5. Rated 4 out of 5 by Anonymous from Beautiful Ordered this for mt wedding ring wasnt in stock when i ordered so have to wait for it to arrive but tried on instore before i ordered and looks lovely with my engagement ring not seen a nicer one got when on sale so saved 35% off price.